During March 2004, a trial excavation was conducted at Tel Kabri (Permit No. A-4134; map ref. 21311/76789), prior to planting trees. The excavation, undertaken on behalf of the Israel Antiquities Authority and underwritten by Qibbuz Kabri, was directed by N. Getzov (field photography), with the assistance of Y. Lerer and A. Shapiro (GPS) and H. Tahan-Rosen (pottery drawing). 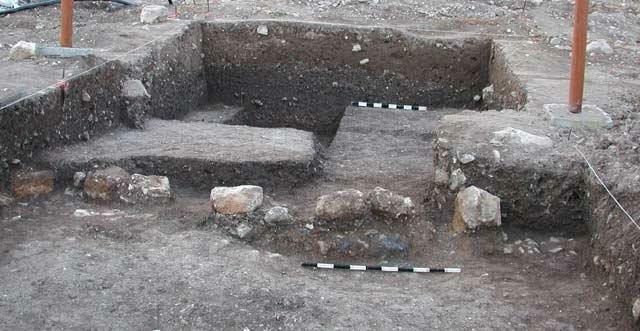 The excavation was conducted northwest of Tel Kabri, which is north of Nahal Ga‘aton, near the exterior face of the rampart that surrounds the remains of an ancient city from Middle Bronze Age II. Remains dating to various periods, from the Early Chalcolithic until the Byzantine periods, were found near the tell, as well as two large springs, remains of flour mills and of Arab villages. An Ottoman aqueduct leading to ‘Akko is located close by. Research and excavations had previously been conducted in the area (Fig. 1; Kempinski 2002; Shalem 2009). Two squares were excavated and three strata (I–III) were identified; habitation levels and remains of an aqueduct were exposed. Stratum I. Light colored soil (max. thickness 0.8 m) containing an abundance of potsherds, animal bones, flint tools and stone artifacts from the Early Chalcolithic period (beginning of the fifth millennium BCE), Early Bronze Age IB, Early Bronze Age II and Middle Bronze Age II. Several present-time remains that are the outcome of dumping soil in the modern era were also found. Stratum II. Remains of an aqueduct (Fig. 2)—the floor of the aqueduct and part of its sides, most of which have been displaced due to modern plowing. Based on several of the potsherds in the foundation of the floor, the aqueduct can be dated to the Late Roman period (third–fourth centuries CE) or the Byzantine period (fourth–seventh centuries CE). The floor and sides were coated with calcareous plaster, on which travertine had scaled, indicating a prolonged use of the aqueduct. These remains are very different from the massive remains of the ottoman aqueduct to ‘Akko. Stratum III. Alluvial sediment containing small angular and semi-round stones mixed with a few potsherds from Middle Bronze Age II (depth of the excavation 1.9 m). In addition to the archaeological excavation, thirteen probe trenches were dug with the aid of a backhoe, revealing meager finds close to the surface. These primarily consisted of small pottery fragments from the Roman period, which originated from nearby sites as a result of modern agricultural activity. Potsherds that probably dated to the Late Chalcolithic period were found in four of the trenches (depth 0.8–1.3 m), including a flared-rim jar (Fig. 3:1) and a lug handle with a thumb indentation (Fig. 3:2). This is the first discovery of remains from this period near Tel Kabri. The excavation contributed to our understanding of the agricultural area along the fringes of Tel Kabri. It turns out that the ancient city did not expand into this area and it was used for farming in antiquity as well. The aqueduct is indicative of irrigation and today’s banana farmers are therefore continuing a tradition of irrigated agriculture thousands of years old. Kempinski A. 2002. Tel Kabri: The 1986–1993 Excavation Seasons (R. Oren and N. Sheftelowitz, eds. ; Tel Aviv University, Institute of Archaeology, Monograph Series 20). Tel Aviv. Shalem D. 2009. Results of a Salvage Excavation at Tel Kabri. ‘Atiqot 61:19–39. 1. 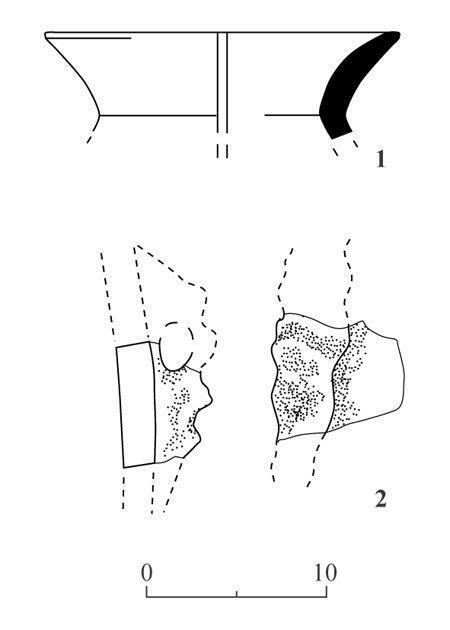 Prausnitz 1958 and 1975 excavations (&-17/1958, A-542). 1. 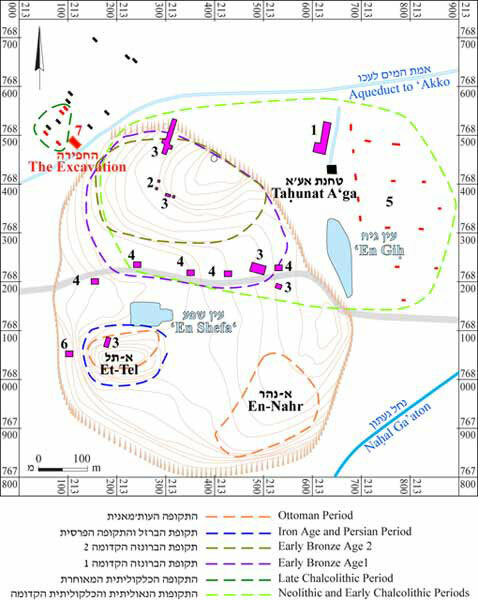 Map of Tel Kabri and the various excavation areas. 2. Remains of the aqueduct, in Stratum I (light color) and Stratum III (dark color), looking southeast.